It took until the ninth game for Great Lakes' Niko Hulsizer to hit his first long ball in the Midwest League. He wasted no time collecting the next two. 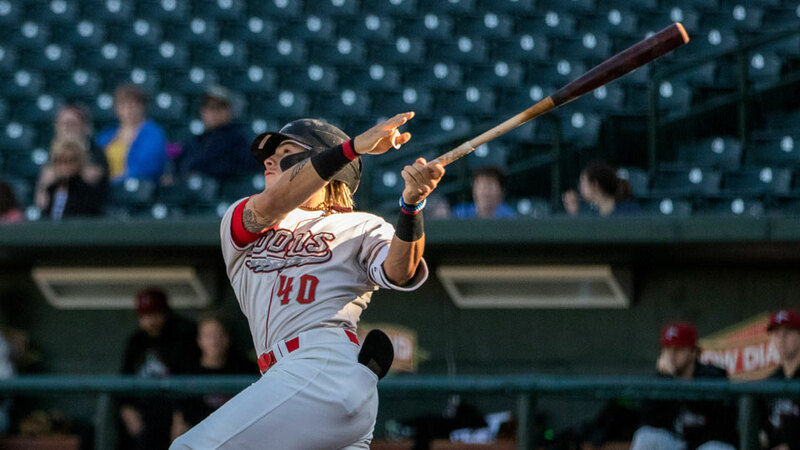 The Dodgers outfield prospect bashed three homers and drove in four runs, but the Class A Loons fell to the Cubs, 6-5, at Four Winds Field on Monday night. "It feels good. You never are really expecting a night like that," Hulsizer said. "I felt like I was on the ball and they kept on throwing it in my zone and I capitalized." The designated hitter connected on a 1-1 count pitch from Cubs No. 3 prospect Brailyn Marquez in the third inning, knocking it over the wall in left-center field for a two-run shot. In the sixth, Hulsizer pulled a line drive to left for a solo shot off Faustino Carrera. The 6-foot-2 right-handed hitter got to the left-hander again in the eighth, knocking a no-doubter over the wall in left-center. The fact he saw a good pitch during his last at-bat surprised Hulsizer. "I really didn't think they were going to give me too much to hit after the previous at-bats, but (Carrera) tried to challenge me again and I nailed it," he said. Jogging his memory, Hulsizer only recalled one other time that he had hit three home runs in the same game. "I did it in college, I think, my sophomore year," the Morehead State product said. Hulsizer was drafted by the Dodgers in the 18th round of the 2018 Draft. Last season at Rookie-level Ogden, he batted .281 with nine home runs, 13 doubles, 47 runs, 32 RBIs and 30 walks in 48 games. The 22-year-old has dedicated himself to becoming a more flexible hitter who is able to hit an offering at any location. "I'm trying to get myself into a good hitting position and being to handle any pitch so they don't just try and key on me in one spot," Hulsizer said. Nobody on the Loons roster homered until the ninth game of the season, a stat he credited to cold temperatures in the early going. "The weather has been tough here and the wind has been blowing in," Hulsizer said. "I'm just focusing on hitting the ball hard and not really think about too much else. I've have decent amount of success and tonight it really showed." Dodgers No. 11 prospect Jacob Amaya doubled home No. 21 prospect Leonel Valera in the seventh for Great Lakes' other run. D.J. Artis drove in two runs and scored twice while Tyler Durna had two RBIs for South Bend. Jonathan Sierra added an RBI and a run and Cubs No. 5 prospect Cole Roederer drove in one.